Hi everyone. Hope your week is going well. We are in the middle of a hot spell - temps in the mid 90's with the heat index in the 100's. Needless to say this Mama is not spending much time outside until late evening. So this week I'm bringing you a bit more of the summer tweaking I have been doing enabling me to still be productive but inside. 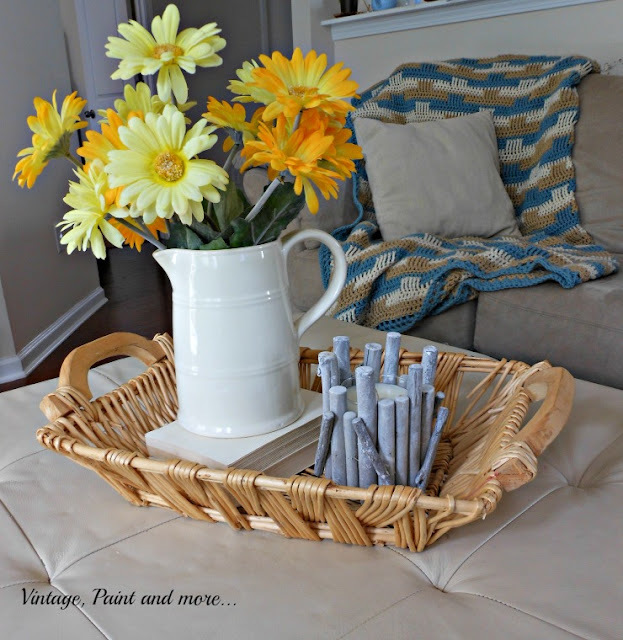 I put together a simple little vignette for the ottoman in our family room. I don't do much special decorating for summer. I like to keep it simple and bright for the summer months - nothing too busy or cluttered because it just seems to add to the chaos of summer living. 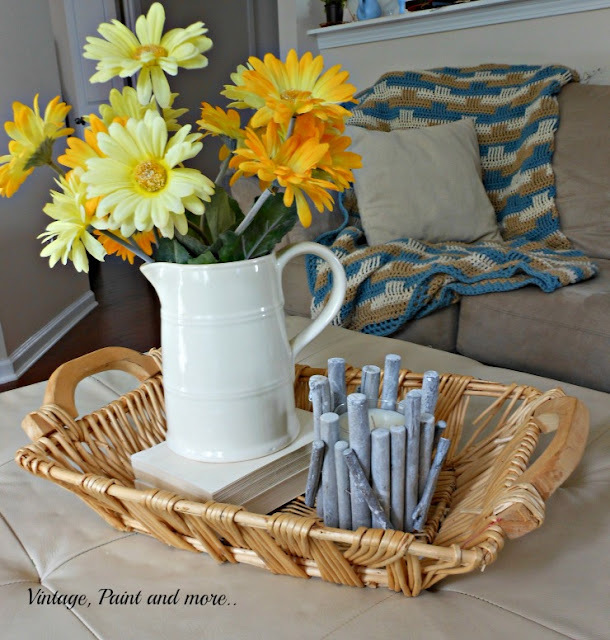 I started with a light colored tray basket I picked up at he thrift store for a couple of dollars and added a stack of old books sans covers. On the books I set a white pitcher filled with "faux" yellow daisies. So bright and cheerful in any season. Then I added a driftwood candle holder that was a gift from my son. Easy, simple, bright and just right for this busy area of our family room. And when I need more space it's very easily moved. 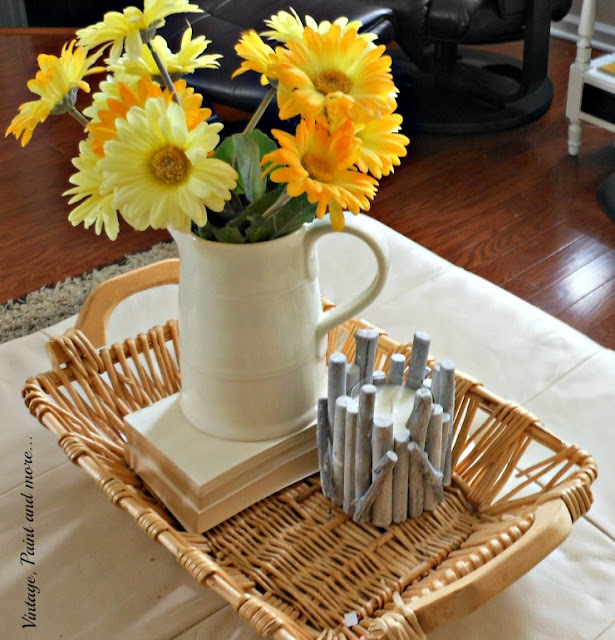 Do you decorate for summer or just keep it simple like we do? I love to hear from you so tell me about it in the comments below. Want to make sure you don't miss anything? Be sure to sign up for email in the Hello bar at the top of the page. I will be linking up to the parties listed on the Where I Party. Please be sure to stop by and visit them. You'll find so much creativeness and inspiration at each one. I love the vignette! That driftwood candle is adorable. I do decorate to a degree for summer. I have so many deep jewel tones throughout my house that I like I tone them down and brighten up for the warmer months. It's a bit like redecorating every six months! 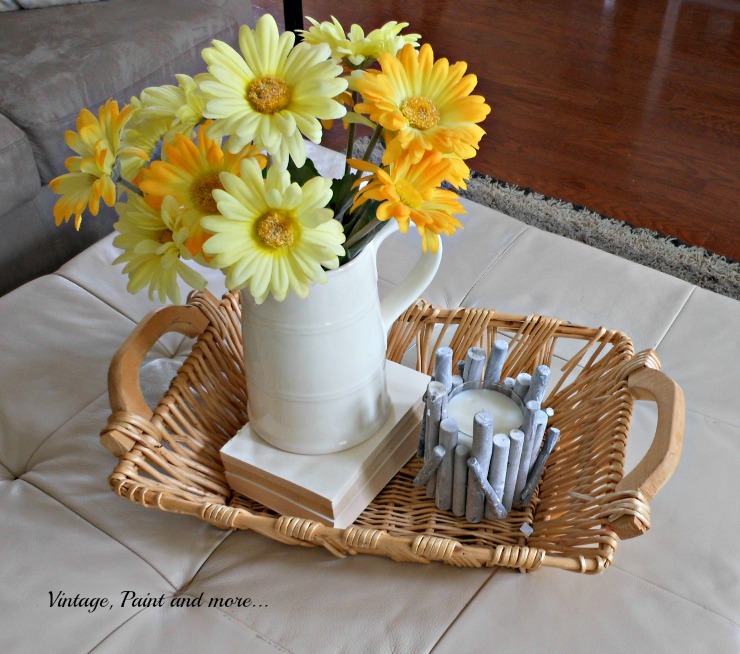 Love your summer vignette! Hopefully the weather will start to cooperate with you soon! It has been rather crazy around here. One day its hot and sticky then the next it,s low 70's. I love that little candle you used, such great texture to it. I keep things very, very simple in the summer. Last year I think I had an old pickle jar (cleaned out and label removed) filled with sand and a candle. I like the flowers so much better- a little burst of color! Easy, Breezy, and you can move it quickly if you need too. I like that! You have such good taste, as usual. God, I am sick of the heat. Very sweet! Those yellow flowers feel so summery! I cut flowers from the garden at least once a week ! Your summery vignette is bright and fresh. I love it! Perfect for summer Cathy! Thanks for sharing with SYC.